Curious why I haven’t posted since March 2018? Scroll down for my updated blogging plan. Since reading this post about seeing your blog as a library, I’ve been thinking about the library I’ve created here at Content Mastery Guide. I’m very proud of the content I’ve produced, yet I sometimes wish it was easier and quicker for you to get your blogging questions answered. I decided to identify the three core messages about blogging that I’ve found myself repeating over and over again through the years, and the ones I most want you to understand. Next, I rounded up my very best posts and resources that reinforce those lessons, and gathered them for you here in one easy-to-use collection that will greet new and returning blog readers for years to come. I’ve shared previously about some changes in my business, and the uncertainty that comes along with that. While I tried to keep blogging even through that confusion, I decided to step away for three months in March 2018, which coincided with my upcoming wedding and honeymoon. I made no pledges or promises about what to expect from me. Instead, I wanted to stay open to seeing how things unfolded. What I ultimately decided was to stop posting new content on this blog and to stop sending the Blogging Tips newsletter. 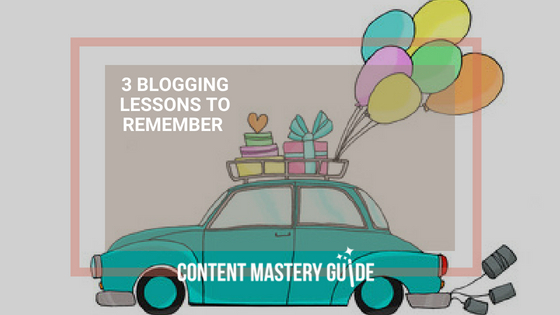 You will still be able to access the Content Mastery Guide library and its archive of almost 650 posts. I have no plans to take down this blog. And because this is the post readers will see first when they visit, it will be clear why and when I stopped posting. I’ll also be shifting the focus of my business away from writing and content marketing, and towards editing. I’m still happy to edit your blog posts, along with other written content such as newsletters, social media ads and profiles, email messages, journal articles, and e-books and other educational materials. I’ll also continue editing and ghostwriting books about personal and professional development. Please contact me now if you’d like to discuss any of these services. Until then, happy writing!